Recently another high international recognition was given to H.G. Prof. George Popper - President of IBSSA and Prime Minister of the Government of KMFAP (Sovereign Order of Saint John of Jerusalem, Knights of Malta, Federation of the Autonomous Priories) The "Diplomatic Mission for Peace and Prosperity” - recognised by the United Nations - appointed H.G. 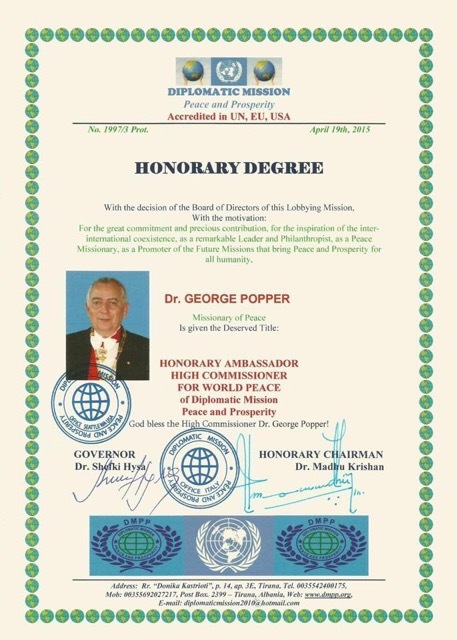 Prof. George Popper for Ambassador of Peace and High Commissioner for World Peace on the 19th April 2015, recognizing by this prestigious award his outstanding international activities, with special regard on the “Partnerhip for Security and Peace” program, which was established by his initiative and managed by him since several years.